Apparently, October 18 was a big day for crokinole players across the continent. 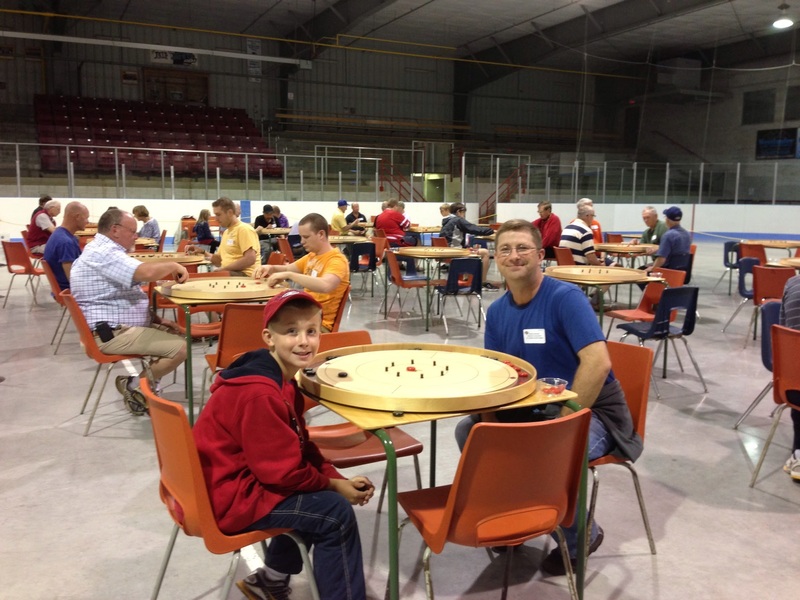 At the top of the list the NCA sanctioned Ontario Doubles Crokinole Championship has held in Brucefield, ON. 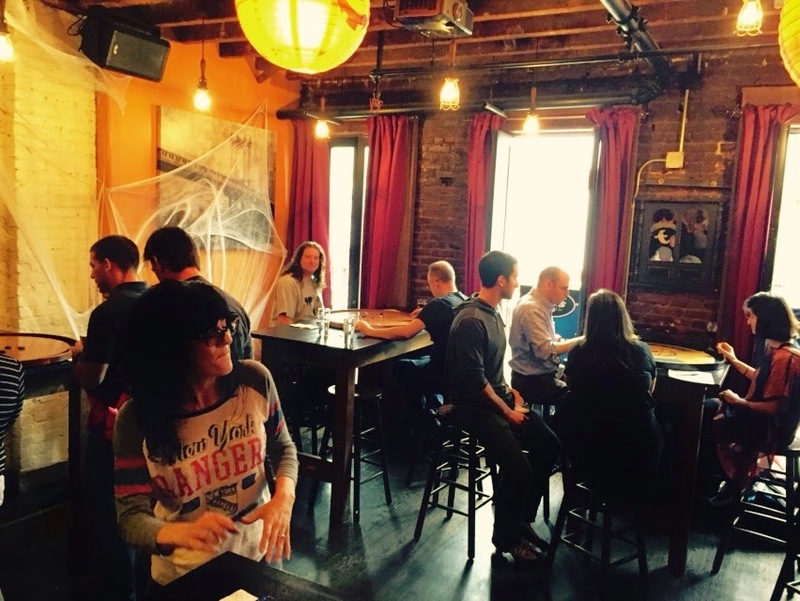 A couple other fun events were being held: #Crokchella in Calgary and of course, the 4th annual Choner Crokinole Championship in Astoria, Queens, NY. It's quite impressive the event that Erik and Lisa put on year after year. And each year, they bring it to another level. An fun and slightly irreverent event attended by over 30 people, Erik likes to say the event is more about the giveaways than crokinole. 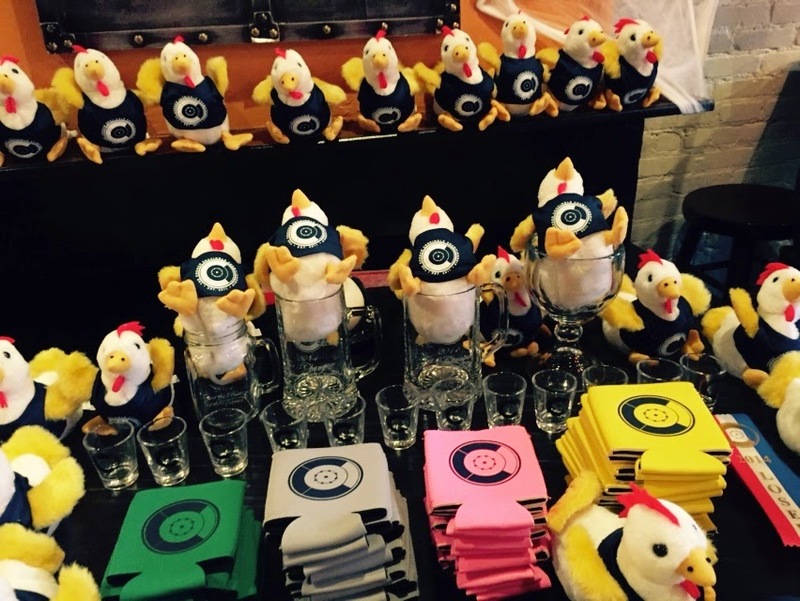 This year's mascot was the Choner Chicken, and everyone walked away with their very own stuffed chicken complete with Choner t-shirt. True to tradition, Erik's brother, Matthew, wore the "First Loser" sash on account of his runner-up status from 2013 throughout the event. Erik's introductory address also described the tournament format. Each participant would be placed into a group of 4 which would compete in a round robin. The group ranking establishes the single elimination bracket by tier (4 tiers). From the Championship Chalice to the "Bottle of Barrel" jar, Erik awards bracket winner and cool engraved momento from the event. As I drew my group number, Erik apologized to Avri K (the inaugural Choner Champion) for my placement into his group. Erik also highlighted my past competitive crokinole experience at the World Championships. Though he didn't mention how outclassed I was in Tavistock. Through a bit of embarrassment, I ventured on, helping a few crokinole new comers with the rules and gameplay. Choner games are played 12 discs-a-player and first-to-100 with exception of the championship final which is played first to 200. During the group stage, I played with familiar faces from 2013 and found my last group match with fellow former champion Avri. Our head to head match up would decide 1st and 2nd place. "Which board do you want to play on?" "Not yours." "No problem, not yours either." Avri and I found one of Erik's Hilinski boards and started our round. Its always interesting to play on different boards even at the same event. With some defensive play, I was able to edge out Avri to enter the championship bracket. There were only 28 players in the group stage, so each bracket had 7 players. Erik cleverly devised a scheme for each tier to establish a player with a first-round-bye: One shot each, buy goes to the player with the closest-to-the-center shot, eyes closed for 3 seconds. Not really the test of skill I was going for, but I was pleased to secure a buy ("Shocker!" exclaimed Erik) with a hanger. Chicken wings, salads, nachos, and more than a few pints were had as the brackets began play, taking turns on the approximately 9 boards that were brought out. It really was a fun location and great to meet so many interesting people. I was also excited to witness one of the strangest shots I think that has ever been seen in crokinole. As Mike's disc was not laying "flat" in the center hole, it was ruled a "15." In the second round of the championship bracket, I faced my friend and coworker, Mark in his first appearance in a "competitive" crokinole event. I vanquished him handily (love you, man) and earned my right to deliver him his participation ribbon (irreverently labeled "Loser"). I then got an opportunity to watch the other semifinal match. It was a long match, each round rather delivering more than 10 points. Until Josh Z finished his opponent witha 35 point round. We began the championship round winning our respective "hammer games." Fortunately I was able to hold Josh to 5-10 point games and score 20-30 point games to get to an early lead. With Josh under pressure, I was able to adjust conservatively and secure a successful title defense. I've heard rumors that Erik has "special rules" and plans for me next year, so I'm sure the target on my back has only become bigger. If you find yourself in the New York City area in mid October, I highly recommend you join us at an upcoming Choner Crokinole event. Erik puts on a great time, and is especially great at designing t-shirts.